Community Managed Water Systems have emerged as an alternative system to guarantee the provision of water to marginalized, rural communities in El Salvador. This research used a combination of interviews, secondary data analysis as to identify the institutional and governance challenges they face, which includes violations to the human right to water to safe, accessible and affordable sufficient water. 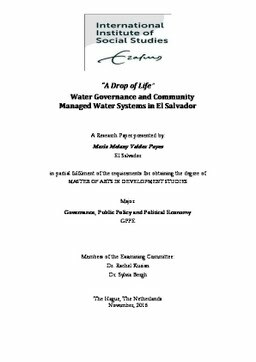 Water governance is a key component of human rights and the development of communities, so this paper offers a broad perspective on El Salvador’s rural communities experience in creating effective water systems and offers recommendations to address some of the most urgent challenges.